The Christmas holiday is upon us, and we’re pretty sure when you hear the words “wreath” and “garland,” Christmas decorations spring to mind. But we aren’t talking about those fragrant signs of the season. We are talking about a stylish take on Wedding Cakes that has nothing to do with Santa and his reindeer, but has everything to do with a perfect desert on your wedding day cake table. These whimsical wedding cakes are adorned with wreaths, or garlands, or swags of something beautiful. These bakery delights can be topped with anything from handmade sugar confections to natural elements – and therefore they can lend themselves to any style wedding decor. For example, if you are planning a feminine-but-rustic nuptial, take a peak at this glorious customized cake by Baker’s Brew Studio, which features hydrangeas, greens and twigs. It is the absolute perfect combination of girly & foresty. Perched atop of wood slice, the swag of loveliness accentuates the delicateness of the pale pink ombre cake. We know, you want a matching crown to wear. We do too. Are you going with mocha and peach tones for your wedding palette? Get inspired by this yummy milk chocolate and gold three-tiered cake from designer Susan Trianos which features a twig wreath, leaves, tiny beaded pods and one gorgeous rose. 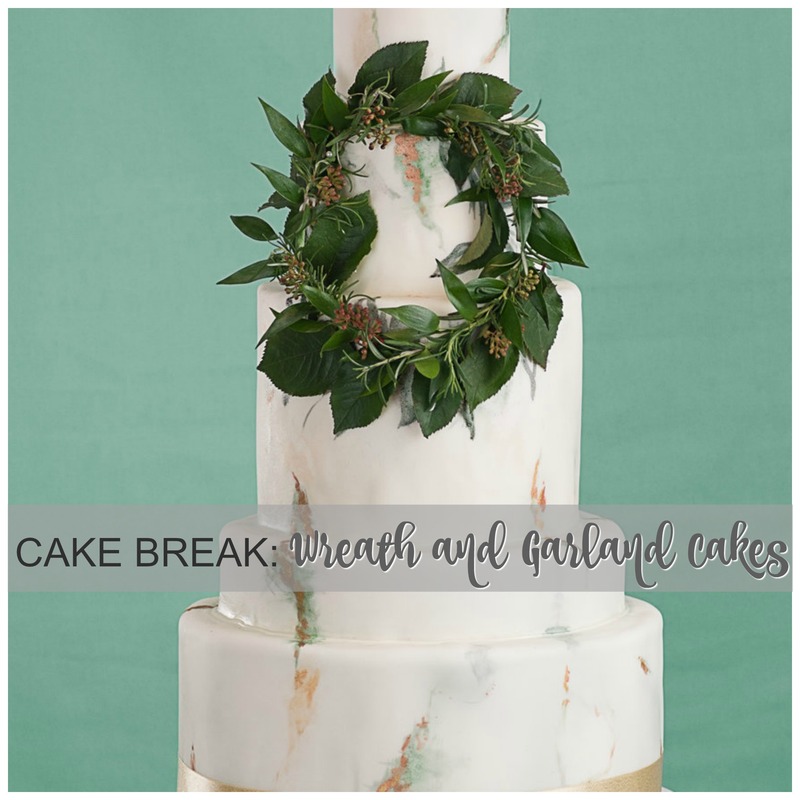 One of the easiest ways to incorporate a greenery garland is to simply encircle the base of a cake. We love the clean, fresh look which would be a snap to recreate for yourself very affordably. Just purchase a white cake and wrap a garland around it. Use a fresh strand of greenery from your florist, or purchase an artificial one. We are enchanted with the posh British cake design house Rosalind Miller‘s botanical collection, (image by Mowie Kay) seen below. Swags of sugar florals never looked more gorg! However you envision your special day, there is the perfect garland or wreath cake for you. You’ll love it so much it will feel like Christmas!